If you’re having trouble fitting a whole grain into your busy schedule, I have a suggestion for you: Pick up a package of Wolff’s kasha. 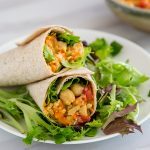 It can be used pretty much anywhere you’d use rice, quinoa, or millet, it cooks up faster than any of them, and best of all, it’s safe for your gluten-free loved ones. So what is kasha? Here in the U.S., it’s the term for roasted buckwheat groats (in Slavic countries, it means porridge in general). Buckwheat, which has a nutritional profile similar to wheat, is not really a true grain at all but the seed of a plant related to rhubarb. It’s one of the oldest and most traditional foods in Russia. To become kasha, the black, inedible outer hull is removed, and the buckwheat is roasted. You can buy it either whole or granulated, and though both forms cook quickly, the granulated is slightly faster-cooking, for those of us who put off preparing dinner until the last minute. I decided to do something a little nontraditional with my medium-grain kasha and used it instead of bulgur wheat in a salad called kisir, the Turkish form of tabouli. But then I had trouble. I couldn’t find the Turkish hot pepper paste that most kisir recipes call for, so I used Sambal Oelek chili paste instead. And though I was eager to use my pomegranate molasses in the dressing, when I took it from the refrigerator door, I found it had turned into a pomegranate rock and I had to use agave nectar instead. Despite these substitutions, this salad turned out to be one of my favorites. The kasha has a stronger flavor than bulgur or quinoa, deep, nutty, and somehow earthy, but it blended well with the aggressive flavors of the hot pepper paste, mint, and green onions. Since I like things spicy, I used two teaspoons of chili paste, but if you’re not a heat lover, try it with less. 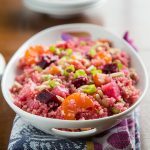 Or check out my similar International Quinoa Salad, which is milder and could always be made with kasha. 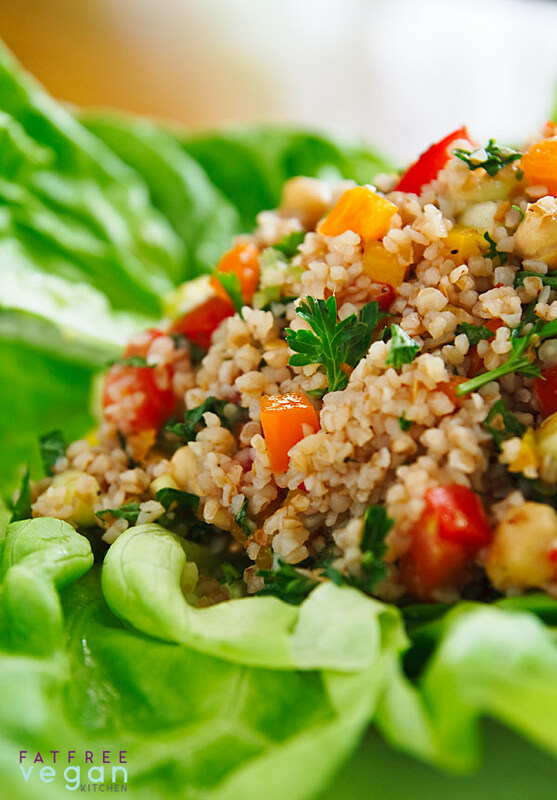 Instead of kasha, you can substitute 1 cup of quinoa, bulgur wheat, or any whole grain and cook it in the amount of water appropriate to the grain. Check a grain cooking chart such as the one here. Heat 2 cups of vegetable broth (or heat water and add vegetable bouillon). 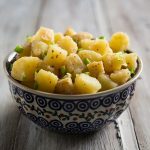 While you’re waiting for it to come to a boil, toast the kasha in a large, dry saucepan for about 3 minutes, or until it releases a nutty aroma. When the broth reaches a boil, add it carefully to the kasha (watch out for spatters!) Cover and turn the heat very low. Cook until kasha is tender and all liquid is absorbed, 5-10 minutes. Remove from heat, fluff, and allow to cool. Kasha can be refrigerated and stored overnight, if necessary. Add all chopped vegetables and the chickpeas to the kasha. Mix the lemon juice and remaining ingredients well and add them to the kasha, stirring so that the dressing is distributed evenly. Serve mounded in the center of a large platter, with butternut lettuce leaves. 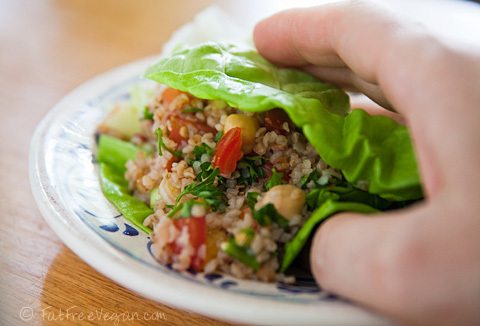 To eat, spoon some of the salad into a lettuce leaf and eat like a taco or burrito. Susan, I'm curious as to what red chile paste you use? Thanks! Laina, I used Sambal Oleck from Huy Fong foods. I get it at the local Asian grocery. Are there other ingredients I might need for some of your recipes? If I purchase this online, I thought I might as well get a couple other ingredients while I'm at it if I may need for another recipe. Laina, I don't know if you mean specifically Asian ingredients or not, but some of the ingredients I often use but people might have trouble finding are fermented black beans (Asian), dried shiitake mushrooms (Asian), dried porcini mushrooms (Italian), panch phoran (Indian), ginger paste (Indian), chipotle chile powder, New Mexico dried chiles, Ancho chile powder, Mexican oregano, nutritional yeast (health food store), and no-chicken broth or bouillon (health food store). Those ingredients seem to come up again and again, but I'm sure there are others that I'm not remembering. Ah! I was looking for a recipe with rhubarb, but you only mention it in passing here. Please Susan, what can I do with rhubarb that doesn’t involve insane amounts of sugar and fat? Lisa, I have to admit that I’ve never cooked rhubarb. It’s not grown in my area, so I don’t use it. Sorry I can’t help! Just wanted to let you know…I just “liked” you on facebook!! I absolutely love your recipes!!! I am always struggling to lose 10-15lbs and stumbled onto you from searching for Eat To Live recipes!! I love that book but don’t follow it as much as I should! I am super active…right now training to ride in a 100 mile bike ride and think i’d starve if I followed the recommendations in that book too closely! But I think I might follow it more closely to see if I can shed those 10 lbs!! One of my new favorites..have served it to many friends who also love it. Thanks Susan ! Keep it in the fridge. Even there, if you don’t use it up within a year, it will start to dry up. You can use it in lots of recipes, so do a google search to see what you can find. Made this a little while ago, and it was delicious! I didn’t have pomegranate molasses, so I used the agave, but I didn’t want to completely scrap the pomegranate so I added pomegranate seeds. 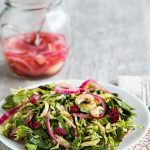 😀 Unfortunately, the taste of the pomegranate seeds are kind of drowned out by the flavorfulness of this salad, but they do add a pretty touch and provide a bit of juicy crunch. Really enjoyed this salad, and will be trying more of your recipes! I just noticed an ad for NZ Salmon pieces appear on the side of this page. I guess the ad is targeted to where I live (NZ), but thought I would let you know. 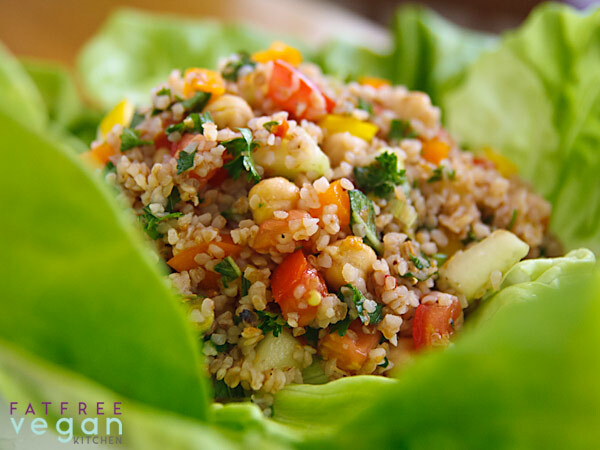 I want to make a different kind of grain salad for one of the supper dishes for family coming over. I need gluten free so this fits the bill but several cannot eat hot sauce spicy. Any suggestions to substitute so it doesn’t taste bland? (I’m sorry, I know the recipe is for a spicy dish!) Maybe just a lot of white pepper? Sally, white pepper is actually hotter than red pepper, so I definitely don’t recommend that! You could just try adding a little of the herbs of your choice, such as oregano and basil to increase the flavor without heat. 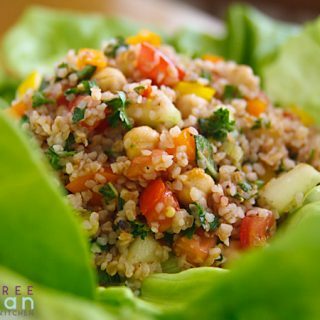 Sounds wonderful, new to buckwheat recipes!